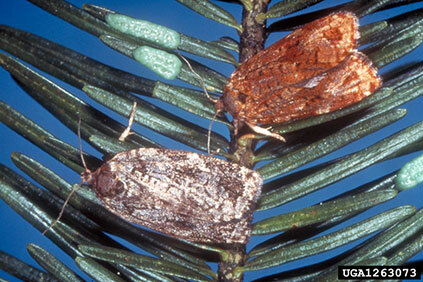 As with many forest pests, the damage spruce budworm causes is more visible than the insect itself. 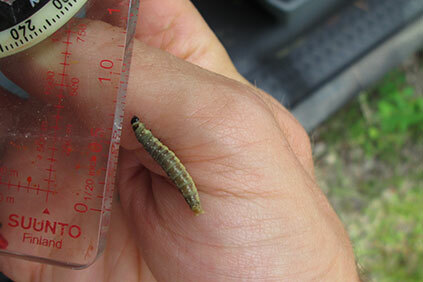 Budworm feeding typically starts at the tops of trees. Affected spruce and fir often look scorched from budworm feeding in late June through July (Figure 1) because many partially chewed needles become discolored and get caught in budworm webbing. 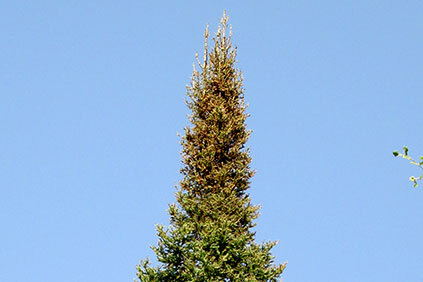 Upon closer inspection, new shoots of spruce and fir will have many missing and partially chewed needles (Figure 2). The full-grown caterpillars have a dark, shiny head and is dark brown with light-colored spots along the back (Figure 3). They are found from May through June. Pupae may be found within webbing at the end of twigs. Adult moths are small (less than one-inch wingspan) and mostly grey but may be reddish-brown with dark markings (Figure 4). They may fly to lights in great numbers in late June or early July. Figure 1. A balsam fir in late July with a scorched top from spruce budworm feeding. Figure 2. Typical feeding damage from spruce budworm on fir in late June. Note the caterpillar at the base of new shoot. Figure 3. Spruce budworm caterpillar in late June. Figure 4. 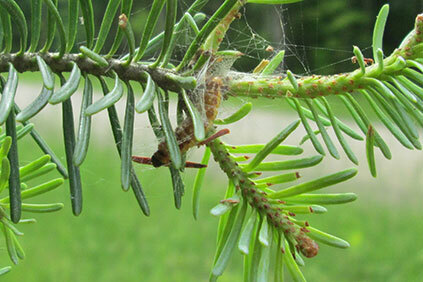 Spruce budworm moths and eggs on balsam fir. Photo by K.B. Jamieson, Canadian Forest Service, Bugwood.org.